This selection of year two sentences worksheets gives kids essential writing practise. Using common sight words and fun themes, these printables help first graders build sentences all on their own. Kids just beginning to learn how to write need plenty of time to practise. This will build their writing fluency as they move into more complex writing assignments in the upper elementary grades. 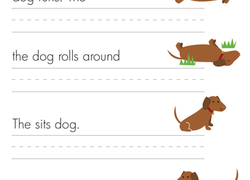 Give kids confidence in their writing skills with these year two sentences worksheets.